Hello Friends! I have been saying for some time now that a Pacific Pullover Sew Along is coming soon. The exciting news that I have for you today is that "coming soon" finally has specific dates! 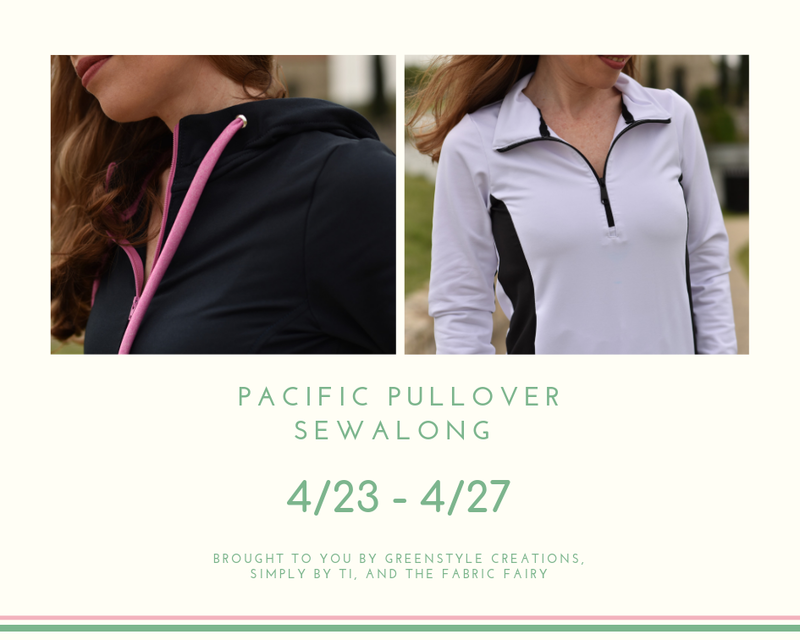 Starting a week from today, April 23rd, I will begin the 5 day journey with you to sew a Pacific Pullover (or two or three or ten!). I am so excited and hope you join me! This sew along could not have come at a better time. You may have heard about Spring time in Texas. One day its 75 degrees and perfect for a meal among friends on a restaurant patio. Then, 12 hours later it will turn windy and 40 degrees with rain in the forecast for days. Because of the unpredictable weather this time of year, I find that the Pacific Pullover is the perfect extra layer to keep handy when the ideal temperature begins falling fast. I also like to make the tank version of the pattern for when our weather finally cranks up the heat and we have consistent 100 degree days. For today's post, I am going to walk you through what to expect and how you can be ready when the sew along begins next week. If you do not own the pattern, you will want to grab your pattern here if you do not already own it. Use coupon code "PacificSAL" to get a 25% off discount on the Pacific Pullover Pattern. The coupon will be valid today through April 23rd. If you are new to Greenstyle or PDF Patterns in general, read the Greenstyle 101 post on the Greenstyle blog before you print. If you already own the pattern, it has been updated so you will need to go into your downloads in your Greenstyle account and redownload the pattern. The main pieces that have changed is: the shoulders in the smaller sizes, the kangaroo pocket for the front, and the collar option. Make sure you have a plan for which option(s) you want to try during the sew along so you are prepared with the correct supplies. For the front, choose between a kangaroo pocket, princess seam pockets, and no pockets. For the neckline, choose between a neckband, zippered hood, non-zippered hood, or a zippered collar. You can make the top sleeveless with a facing or with bands, or you can choose the two piece sleeved that is hemmed, cuffed, or has thumbhole cuffs. Also, the pullover can be hemmed or banded at the bottom. Whew! You will need to have a knit fabric with at least 50% stretch both horizontally and vertically. Great choices for this pattern are athletic and performance fabrics such as Athletic Brushed Polyester (ABP), Yoga Knits, Supplex, and mesh. Powerstretch Fleece, Scuba, Ponte, and French Terry (usually the ones with lycra added) are also great choices if they have the required stretch. The key to any fabric you select is that it has the right stretch for this pattern. On my dark navy blue pullover, I used a Fleece Backed Under Armour Lycra Fabric from Simply by Ti, and it was very easy to work with and made a cozy pullover. On my grey pullover, I used a Polartec Powerstretch Fleece Knit Fabric from The Fabric Fairy. It was much more stable and thicker and was bulkier at the hems. It is my warmest pullover yet, and I am so glad to have a thicker weight one for the extra cold days. On my pink/grey tank, I used light weight athletic brushed poly from Zenith and Quasar. This tank will be perfect for sweaty work outs and for 100 degree days. My black and white cropped pullover is supplex that I purchased from the Dallas Fabric District. It is a lighter weight supplex and will work when the temps aren't quite so cold. The weight of the fabric you choose will make a great impact on how warm or lightweight your pullover is. The thickest pullover that I made is the Powerstretch fleece (grey) pullover. The fleece backed Under Armour pullover is also warm, but is not nearly as thick of a fabric, which made it a little easier to work with and have a bit more drape when wearing. I also noticed it was more comfortable when going from indoors to outdoors, while the grey one has been perfect for outdoors on a chilly day. If you use ABP, the lightweight ones will be great for a tank, and the heavier weight ones would work better for a pullover with sleeves and a hood or collar. I also notice that I like fabrics that are warm to the touch. Some athletic knits are colder feeling fabrics to me. If I want a pullover to stay warm and cozy in, I like fabric descriptions like brushed, fleece, and supplex. The colder, lighter feeling fabrics and meshes make excellent tanks (or hooded tanks!). Coordinating thread. I prefer polyester thread. I use Gutermann Mara Thread for my regular sewing machine. I use Maxi Lock Thread for my Serger. Fusible Woven Interfacing. You need fusible woven interfacing for any of the zipper options. You also need fusible woven interfacing for the grommets if you do the hood option. I use this one from Joann. Fusible Knit Interfacing. You need a knit interfacing if you are doing the facings on the tank. If you do not have knit interfacing, you can use a band on the armholes instead of the facings. I use this knit interfacing from Joann. It also comes in black. Stretch needle. I use Schmetz 75/11. If you do not have a coverstitch machine to hem or topstitch, you can alternatively use a stretch stitch with your stretch needle or you can get a Twin Needle. I use this twin needle on my regular machine. 7, 8, or 9 inch closed bottom (non separating) zipper. You can buy a zipper longer than this, and I will show you how to cut it to your desired length. If you are nursing, get an 11 inch zipper (or longer if you want to cut it down). I order my zippers from here. 1/4 inch grommets (usually called eyelets) and an eyelet press to install them. I used one like this one. Wonder Tape. I use this one. If you are doing the collar option, you need twill tape or woven trim or a soft ribbon (because it will be against your neck). I got my twill tape from Hobby Lobby in the ribbon section. They carry it at many craft stores. Iron, Ironing Board, Scissors and/or Rotary Cutter, Pins and/or Wonder Clips, Washable Fabric Markers or Chalk, and a Sewing Machine and/or Serger. Every day I will post the steps for that day on my blog with videos for those who want the extra help or to watch me sew. I will make a post in the Greenstyle Facebook group with a link to that blogpost. I would love for you to comment on that Facebook post with your progress and ask all the questions that you have. On the last day of the Sew Along (Saturday, April 27th), I will make a post in the Greenstyle Facebook group where you can comment with your finished garment from the Pacific Pullover pattern. I will select one winner at random to win a free Greenstyle pattern, a $25 shop credit to the Fabric Fairy, and a $20 shop credit to Simply by Ti!! Are you excited to get started!? Don't forget to grab your pattern (use code "PacificSAL") and join the Greenstyle Facebook group. I can't wait to sew with you and see what you make! Thanks for reading today! I hope I have inspired you! Please let me know if you have any questions or anything was not clear. You may follow me on Instagram or receive updates by liking my page on Facebook. If you want to take a look into the things that inspire me, you can follow me on Pinterest. You may also follow my blog with Bloglovin. Disclosures: This post may contain affiliate links, which means I receive a small compensation when you purchase via my link. This does not cost you anything, and I appreciate the support. Any and all opinions expressed are still my own. Side Note: I am wearing my latest pair of Greenstyle Inspire Tights and my 15 month old is wearing a new pair of Greenstyle Stride Tights out of ABP from The Styled Magnolia! Some people stopped me while we were taking photos to let me know that our leggings matched. I thought, "hmmm.. I think I know that! Thanks friendly stranger! Haha!"